Little Meerkat is only tiny but not in his mind. He sees himself as the most heroic hunter, the stealthiest scout, the most fearless warrior and certainly not someone that needs to be protected by his family. Until one day when he finds himself confronted by a hungry snake. Then he learns the importance of a loving and watchful family. Little Meerkat is a playful and lively book about a young meerkat who refuses to believe he is anything less than what he imagines himself to be. His daydreams and misadventures bring humour to the story and will appeal to any young person desperate to grow up. The constant message throughout the book is that Little Meerkat needs to understand and accept that he is not capable of everything he imagines he is, yet. He must accept that at this stage of his life, he needs the guidance and protection of his family. Little Meerkat did not like holding paws. Little Meerkat learns this lesson when he is confronted by a snake who wants to eat him. The quick response of his family not only saves his life but also teaches him that maybe he’s not quite ready to be without his family. Shannon Melville’s illustrations bring a richness to the book. They are big and colourful, bringing to life the world of Little Meerkat. There is a certain amount of realism in Shannon’s style but, at the same time, the fun and personality of Little Meerkat and his imaginings are also well presented. 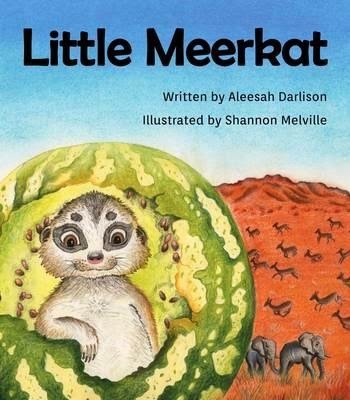 Little Meerkat would be an excellent read-aloud book for pre-school or early primary children. However, with such beautiful illustrations it would also be the sort of book a young child would enjoy leafing through on their own.